I hear you on that one he is hotter then Eric Northman lol.I like the whole mechanical feel he gives.I enjoy watching his systematic way of thinking which always end been right. I like how he can communicate with a stare and you know excatlty what he is saying with out saying a word lol. I like how he acts like his your shadow always looking out for you. The whole distance unreachable thing I agree with you. I think that reason is what makes him a chick magnet lol. Hey, when it comes to REAL vampires, NO ONE is hotter than Eric Northman...!! the Second year in a row. Year before that ? Best Villain ! YOWZA !! I believe it he is scary when he wants to be lol. That's awesome he won it two years in a row. I miss HBO no Vampers, werewolf, friary's, were panthers, and all the other crazy things that came out this summer. I saw two episodes on our stay at motel 6 and I was so lost :'( Erick and Kai are my cup of tea. Only with Erick I'd be more terrified to be left alone in the same room.....he might find me a tasty snack >.<" Unless Kai is with me as my bodyguard to keep him in check. Then my dream would come true both dead guys hotties to myself hehehe drools. Have you seen that movie Straw Dogs? I haven't yet but he plays a psycho killer in this one a live person lol not a vamper which is scary. Bring on Don Henrie. I mean he drinks blood and the whole 9 yards. doesn't hurt that he's hot too. Cryopod on the right, coffin on the left. Life would be good! I know Don he did the show Mad Mad House on scifi I loved him!!!! He made the people drink blood as his challenge. I can't remember the girls name who won right not. But he didn't like her he always was trying to get ride of her. Till she won him over by drinking all 5 glass of blood. I also like Avocado, Fiona, and Art I loved that show so much I was in 8th grade when it aired. I loved Mad, Mad, House too. I really cracked up when they took him bowling! Yes, that was a fantastic show I was so sad when it ended. Yay for Hulu what other shows you enjoyed on the SciFi channel? Why did they change the SciFi into scyfy? 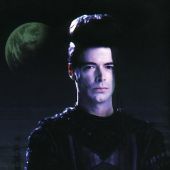 I love Lexx and Farscape second they are the best shows. I like Eureka and Haven. I think they're on SciFi... honestly, ever since I ditched regular tv it's hard to keep track of what's what. All my tv watching is through Netflix and Amazon now. I tried Hulu, but they have commercials. Yuck. I think the SciFi channel made the idiotic move to SyFy so that they could stop showing actual science fiction. Don't they play things like reality shows and wrestling now? Lexx, Sliders, Tripping the Rift, Quantum Leap, Babylon Five, Earth Final Conflict all my old School Shows. Currently I'm into Bedlam and some of the so called reality shows like Auction Hunters, Storage Wars and a lot of time spent on Food Network and Cooking Channel. Kaden wrote: I like Eureka and Haven. I think they're on SciFi... honestly, ever since I ditched regular tv it's hard to keep track of what's what. All my tv watching is through Netflix and Amazon now. I tried Hulu, but they have commercials. Yuck.